All Chief Postmasters General/Postmasters General. 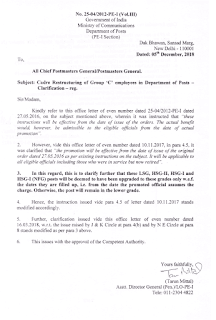 Subject: Cadre Restructuring of Group ‘C’ employees in Department of Posts Clarification – reg. Kindly refer to this office letter of even number dated 25-04/2012-PE-I dated 27.05.2016, on the subject mentioned above, wherein it was instructed that “these instructions will be effective from the date of issue of the orders. The actual benefit would, however, be admissible to the eligible officials from the date of actual promotion “. 2. 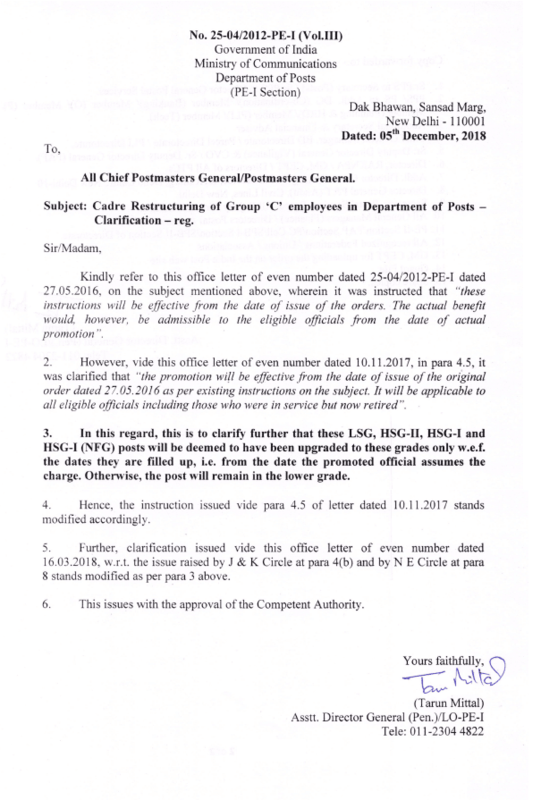 However, vide this office letter of even number dated 10.11.2017, in para 4.5, it was clarified that “the promotion will be effective from the date of issue of the original order dated 27.05.2016 as per existing instructions on the subject. It will be applicable to all eligible officials including those who were in service but now retired”. 3. In this regard, this is to clarify further that these LSG, HSG-II, HSG-I and HSG-I (NFG) posts will be deemed to have been upgraded to these grades only w.e.f. the dates they are filled up, i.e. from the date the promoted official assumes the charge. Otherwise, the post will remain in the lower grade. 4. Hence, the instruction issued vide para 4.5 of letter dated 10.11.2017 stands modified accordingly. 5. Further, clarification issued vide this office letter of even number dated 16.03.2018, w.r.t. the issue raised by J & K Circle at para 4(b) and by N E Circle at para 8 stands modified as per para 3 above.